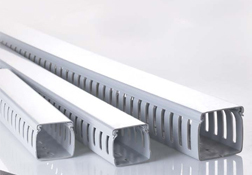 Precision Panel Trunking are manufactured from High Impact unplasticised polyvinyl chloride (UPVC) to ensure panel & machinery safety in extreme conditions. These trunkings are ideal to channelise medium and big size panels & various applications where economy, space saving, safety and durability are paramount. To conduct, organize, and protect cables inside Electrical & Telecommunication panels, Industrial machinery wiring, Computer LAN wiring & Data centers. • Non-brittle, flame retardant, wrap proof • Vertical slids & detachable strips facilitates systematic wiring, permits faster connections, additions & fault tracing of wires • Avoids bunching, taping & provides complete electrical insulation • Unique cover locking design prevents popping of wires while removing cover • Elongated slots at bottom allows flexible mounting • High tensile strength 390 Kg/cm² • Thermal resistant from -5°C to +60°C.